A gathering of CHRISTIAN ORGANIZATIONS, CHURCHES, MINISTRIES and INDIVIDUALS with the sole purpose of Sharing Information, Building Relationships, Offering Support and bringing us ALL closer to Jesus! We would like to invite you to participate in the Fair, have some table space, share your information with the group and network with other Christians interested in what you are doing! HOW DO WE SIGN-UP? 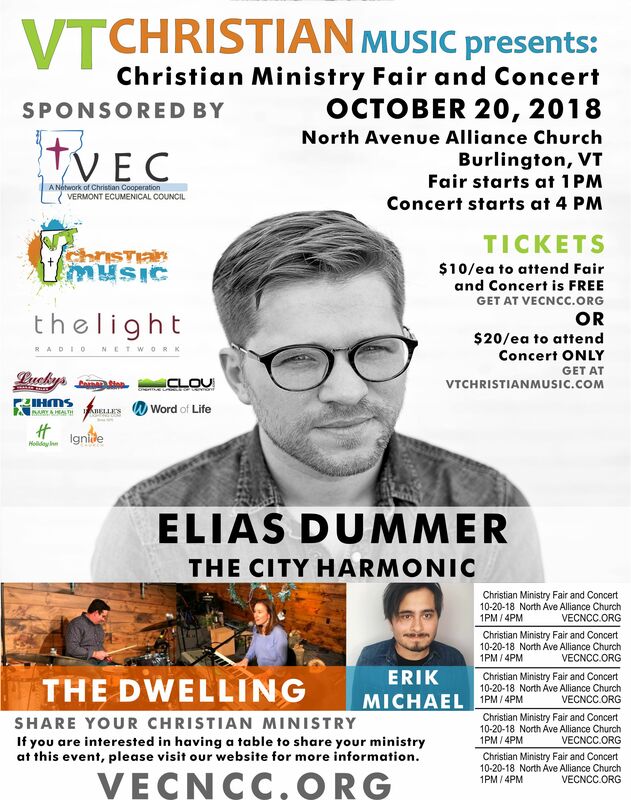 By registering as a member of the Vermont Ecumenical Council – Network of Christian Cooperation, you secure your table space at the event as well as getting two entry fees included. Membership fees are determined by the size of your church or by registering as an Organization. JOIN VECNCC HERE – and we will follow up with you regarding the event. Did you know there are literally hundreds of Christian Organizations and Ministries doing God’s Work, right here in our own state. All of us should know about and support these Organizations and Ministries the best we can. We invite you to come be a part of Christian Cooperation in our state and help be the Hands and Feet of Jesus! HOW DO I SIGN-UP? Individual Registration is $10/person. And anyone who participates in the Ministry Fair can stay for the closing Christian Concert for FREE. Plenty of space at the event – you can REGISTER AT THE DOOR starting at 12:30pm.